Located just southwest of Asheville, in the northern tip of the Pisgah Ranger District of the Pisgah National Forest, Bent Creek encompasses the watershed of its eponymous stream. The Explorer Loop trail passes through a few switchbacks, like this one. Riders on Hardtimes Connector trail. Bent Creek is popular for after-dinner rides, because it is just a few minutes' drive from Western North Carolina's largest city: Asheville. But a large campground, mountain lake, and family recreation area round out the features list to make the area very popular with tourists as well. The area contains a collection of trails that are well suited to a variety of riding styles: beginning and intermediate mountain bikers, families, and groups can have a great time here, but with some trails containing big climbs and technical sections, more advanced riders will also find the trails enjoyable. Though less advanced riders may find them difficult, none of the trails in the Bent Creek trail system are considered extremely technical - especially since most have been re-graded and maintained in recent years. Most of the trails follow old road or railroad beds and have only a few areas that require significant technical skill, with steeps, rocks, roots, mud, and creek crossings. Fast, hardpacked, flowy sections of trail lie between these obstacles. The Hardtimes Connector and Deer Lake Lodge trails are two very popular easy trails near the entrance to Bent Creek. Campground Connector and Boyd Branch are two less often used trails which rank on the easy side at Bent Creek. Venture farther into the area on moderate trails like Explorer Loop and Wolf Branch. Some of Bent Creek's more difficult trails, though not extremely so, include Green's Lick, Ingles Field Gap, and Lower Sidehill. 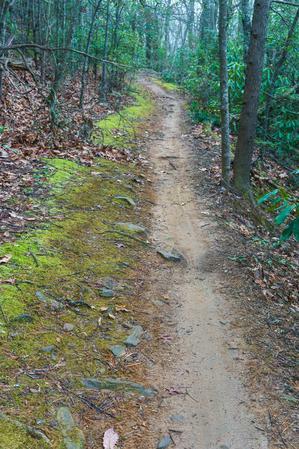 The trail network in Bent Creek can be connected with others in Pisgah National Forest via the unimproved Bent Creek Gap Road to make long, epic-style rides. It's also a perfect place to start riding if you plan on spending several days in Pisgah, getting the feel for Pisgah's trails before venturing farther into the backcountry of the remote areas away from town. After some logging projects in the area which converted some trails to roads, work is still continuing to restore some of the temporary roads back to a trail-like form. This will be a long process, but riding conditions are improving. You can find more about the logging projects and how 1.7 miles of trail were "saved" in this post on the WNCOutdoors.info Blog. This is just an overview of the Bent Creek area; for complete details on each individual trail, visit the Bent Creek trails page. Bent Creek, officially known as the Bent Creek Reasearch and Demonstration Forest, is a designated area for conducting scientific forestry and biological experiments. 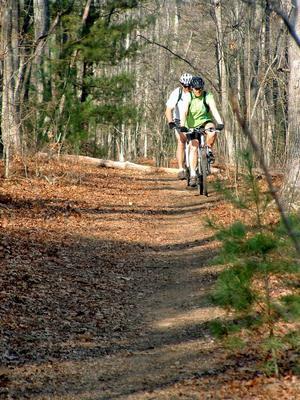 Outside the Lake Powhatan area, research is the area's definitive primary use; recreation (including mountain biking) comes second. Therefore, all trails and roads used in the ride descriptions and maps on MTB WNC have been official Forest Service system trails. 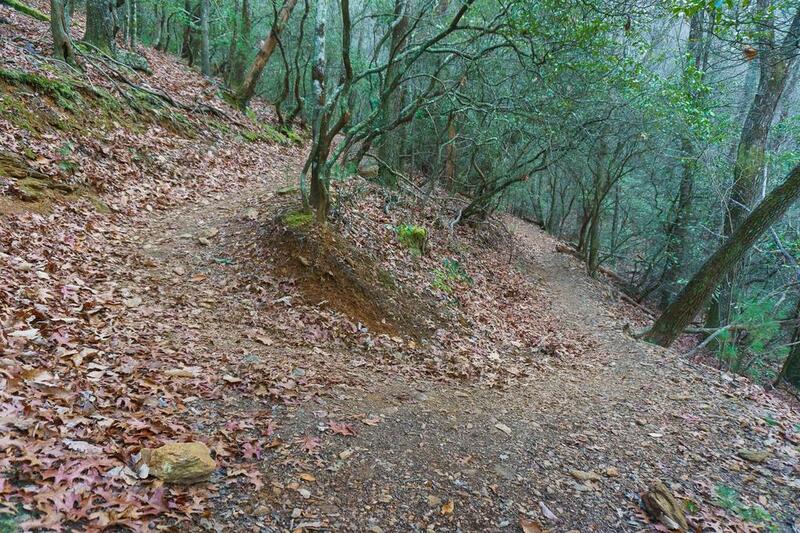 While some non-system, user-created trails do still exist at Bent Creek (and elsewhere in the WNC region, for that matter), don't ride these. You may be cited for doing so. Riding off-trail or riding on user-created trails that are not part of the official trail system may not only get you a citation, but more importantly it may destroy decades of important research that cannot be recovered. If the privilege to ride in this area is abused, bikers and other recreational users may forfeit their right to enjoy the area forever. Since the heinous-trail era in the late 90's, several user-created, non-system trails have been closed and rehabilitated. Several logical user-created trails have been added to the official trail system inventory, including a connector from North Boundary Road to the excellent "Green's Lick" trail (which has seen renaming, realignments, and reopening), and a connector from the end of the Hardtimes Connector trail to the Deer Lake Lodge trail. With a coherent trail network now in place at Bent Creek, good maps available, and good signage in place on the ground, there's no reason to stray onto un-marked trails. Please stay on designated trails to ensure we have future access to this wonderful area for years to come. A lot of work has been put into Bent Creek's trail system over the last decade or more. Here's a summary of what's been done. 2002: A Decision Notice released by the Forest Service bans bikes from trails not signed for them; this stricter standard eventually spreads to the rest of the National Forest areas and is now considered the norm. April, 2004: Forest Service officials began citing mountain bikers found on the closed trails with a $75 fine. 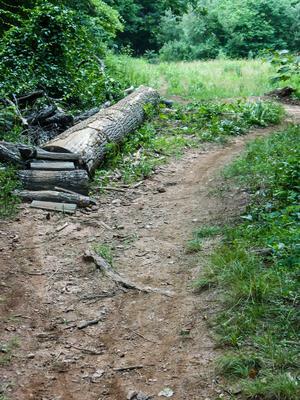 Spring 2006: many of the old trails in Bent Creek were rehabilitated. Light machinery and lots of elbow grease went into re-surfacing about 15 miles of existing trails. 2007: A logging project, completed mid-year, converted several miles of trails into roads. 2007: Lake Powhatan was drained, dredged, and re-filled. It should be deeper and cooler after the sediment removal. 2009: Work on several new parking areas was completed, with expansions at others. The Lake Powhatan Campground is located within the Lake Powhatan Recreation Area at Bent Creek. Open only from April 1 to October 31, this campground offers 85 sites, flush toilets, and hot showers. The campground is near the shore of Lake Powhatan, which includes a swimming beach and fishing pier. You can also ride right out of the campground onto Bent Creek's fantastic trails. Sites are between $20 and $40 a night and the campground can become quite crowded on summer weekends. There is no dispersed camping allowed within this area, and all old roadside campsites along Bent Creek Gap Road have been eliminated. Sites can now be reserved through the Lake Powhatan campground's page on Recreation.gov. 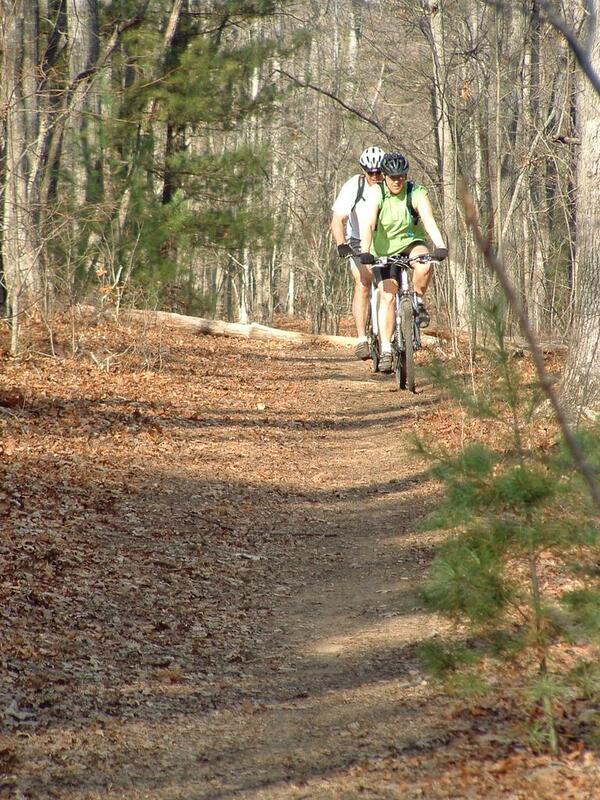 Mountain biking, road riding and hiking galore are only minutes from Apple Blossom Cottage. We're 5 miles from the Blue Ridge Parkway (milepost # 405.5), 10 minutes from Pisgah National forest, 20 minutes from Bent Creek trails and 20 minutes from downtown Asheville! Come back to the cottage after a fun filled day...wash and then store your bikes in the basement, enjoy a cool one on either the front or back porch, then head to the hot tub where you can sit and relax while gazing overhead at the stars and moon while enjoying the luminance of the fireflies! And don't forget...we're PET FRIENDLY! We offer the perfect place to stay for your Western North Carolina biking adventure. The inviting lodge is located in a section of forest between the Blue Ridge Parkway and the French Broad River. You can easily bike or drive from the Lodge to the Bent Creek Recreation Area. The North and South Mills River areas are just a short drive down the road, and the Davidson River area and Dupont State Forest are only 45 minutes away. After a ride you can come back to the Lodge, soak those tired muscles in a whirlpool tub and head for the night life and great restaurants in Asheville, only 15 minutes away! Relax in our back deck hot tub and watch the sunset with beautiful views of Mount Pisgah. Our friendly knowledgeable staff will tell you about all the great places to hike and check out in town. High Speed wireless internet is available. Linens are included. We have bikes to borrow, bus and airport pick up, and camping available as well! Parking is much more plentiful in the area than it used to be; however, it may still be hard to find a spot on more crowded days. Carpool if you can. There are several good starting points at Bent Creek, the most popular being the Hardtimes Trailhead. Others include the Rice Pinnacle parking area, the Lake Powhatan Recreation Area, the Lake Powhatan Campground, Ledford Branch Road and Boyd Branch Road. From Asheville, take I-240 west to I-26 east and get off on exit 2, NC 191. Turn left, pass the Biltmore Square Mall, and head south on NC 191 for 2 miles. Turn right at the stoplight onto Bent Creek Ranch Road, following the brown signs to the Lake Powhatan Recreation Area (bear left at fork after 0.2 mi on this road). The paved, signed Hardtimes trailhead parking area is just over 2 miles down this road on the left. Other popular starting points are beyond Hardtimes further into the valley. To get to the other areas listed above, see the Bent Creek Area Maps.